Happy Friday Friends. It is time for Sweet Treats and boy do we have some delicious goodies for you today. 1. Monique Lhuillier 2012 Spring Bridal. See the entire collection here. 2. This ruffled cake can be made by you. There is a whole DIY on Call me Cupcake. 3. 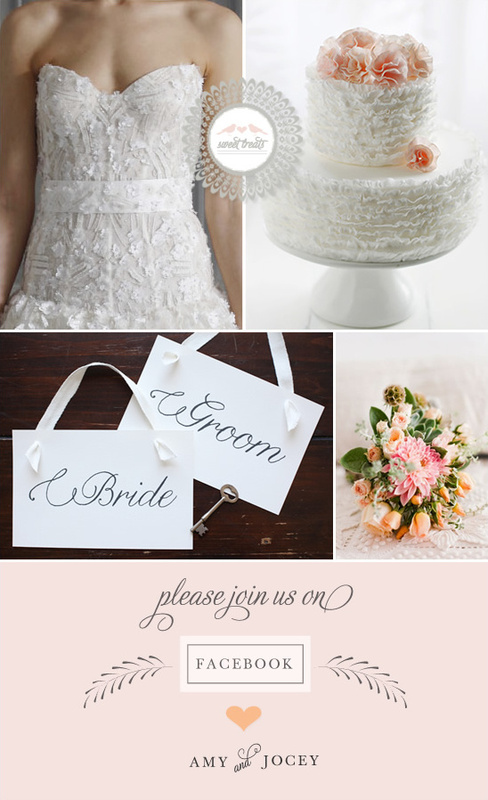 We have some fabulous wedding signs for you. For free of course. 4. Beautiful bouquet from Michelle Warren Photography. 5. We would love for you to join on us on Facebook. Stop by say hi! Bridal Blog Swap Thanks, Jennifer Aniston, for inspiring poppy bridesmaid dresses for all. BRIDEfinds found some gorgeous styles. What's something that every bride has to decide on when planning a wedding? Assigned seating. It's really not as bad as you think, and Every Last Detail's Thursday Tips post tells us a thing or two about it! Find summer inspiration for your wedding with Simply Splendid Centerpieces at Ok, Now What Bride. The love stories of yesterday, affect those of today, yours. bWed Exclusive takes a trip down memory lane to celebrate 57 Years of Love!